It’s Really Heating Up Now! This Loss Brought to You By The Letters T.O. and The Number 41. The last game against the ‘Skins in Texas Stadium, and you have to go and lay an egg like that. Well done. Really. Newman stumbles on several key plays and gets burned with consistency. T.O. drops what seemed like 74 passes. Sure, there were some non-calls by the refs, but refs don’t decide the outcome of games, the players do. The Cowboys played terribly. And yet, they still nearly pulled it out. The thing that bugs me the most about this? T.O. complained about not getting the ball enough. Oh, the ball was thrown to him plenty. He just didn’t catch it frequently enough. On the other hand, #41 admits that he played horribly. And oh, he did. But he admits it. Just don’t do it again, Newman! Chris F. of I Has PC sent me this link in a comment, and I figured I’d post it here. Canadians make some pretty good ads. But, if you look around, they have some really, really disturbing ones too. I saw one during my searches the other day for workplace safety dealing with kitchen grease that just about turned my stomach. And they complain about violence on TV in the U.S.? Anyway, this one is a good one. Not funny, but good nonetheless. On the other hand, there are some ad campaigns that survive the test of time because they are just that good. I think that’s what all of these advertisers shoot for; it’s just that some fall far, far below the mark. Then there are others that start out really good, but taper off as advertisers try to expand on their ideas. The campaign that comes to mind as an example of tapering off is the current UPS “whiteboard” ads. I loved the first ones, how he would erase one or two lines, draw some more lines in, and you’d have a completely different image than you had before. It was clever. The new ads that feature the animation aren’t as interesting to me. Additionally, the separation between a great ad campaign and an annoying one often is a very fine line to walk. Some people may find the campaign to be utterly hilarious, while others may think it is the most annoying set of commercials they’ve ever seen. Take, for example, the recent Snickers ad campaign, “Feast.” This line of ads features a viking, a pilgrim, a medieval lord, and a couple of other folks. The campaign is set in modern times, and the Snickers bar is their “feast.” It’s a bizarre line of ads that, for some reason, makes me laugh nearly every time I see one of the commercials in the line. Though I think they’re hilarious, I also realize that others probably don’t feel the same way that I do, and see the ads as really annoying or just plain weird. I feel the same way about the Burger King “The King” ads. Strange, yet somehow still funny if you can get past the creepiness factor. At any rate, I’ve been trying to think of some of my favorite ad campaigns over the past few years. Here’s what I’ve come up with. Feel free to chime in with your favorites also! 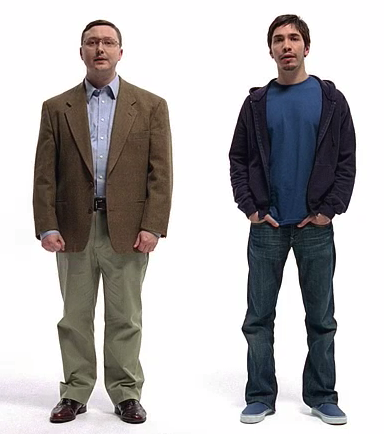 The Mac Ads. Like Macs or not, they’re clever. They’re making somewhat of an impact, too. I recently noticed that Microsoft had its own response ad. Whether you agree with the ads or not, they’re fun, upbeat, and effective at taking shots at the opposition (and you don’t realize just how true they are until you actually make the switch over). Though it’s a separate category, I also love the iTunes/iPod commercials. For awhile, it seemed like every song they used in those ads ended up in my playlist. Very good way to expose new artists. Chic-Fil-A Cows. Though these ads are primarily in print, the “Eat Mor Chikin” cows are one of the longest-running ad campaigns that I can think of. I love this one, too. The subtle humor that they use on each ad is refreshing and clever. FedEx Super Bowl Ads. The FedEx ad campaigns seem to always start with their Super Bowl ads, which, for the most part, are excellent. Their humor is usually understated, not quite as laugh-out-loud funny as other Super Bowl ads, yet they stick with you for quite a long time. Well said, Mr. Turkeyneck. I already talked about it, but I love the Snickers Feast commercials. Click the link for the entire line. Update: Alas! That is not the entire line of Feast shorts. You can find more here and here. I’m sure there are plenty of others, but I’m drawing a blank at the moment. So, I’ll leave you with this. Enjoy! Every once in awhile, along comes a line of commercials that, for some reason, the marketing muckety mucks think is advertising genius that really, really isn’t. For some reason, they decide to stick with these ads for the long haul, regardless of the fact that the commercials make you want to gouge your eyes out with rusty spoons and pour Tabasco sauce into your ear canals. I may not remember the Super Bowl ads from my high school years, but I can remember “Scratchman” of Lotto Texas infamy. There’s a new series that grates on my every last nerve. The folks at Free Credit Report seem to think they’ve struck advertising genius or something, because the last several commercials from the credit rating website have all featured the same guys, singing some of the most annoying, ridiculous, nausea-inducing songs to grace the airwaves in recent months. I am thankful that I have a DVR, and therefore miss the commercials 95% of the time. But during that other 5%, mostly while watching sporting events, I’m forced to watch these horrible commercials. I will never understand how marketers come up with their ad campaigns. Do they just roll the dice and go with whatever is happening? Really. It’s horrible. It reminds me of the 1-800-CALL-ATT commercials with Carrot Top from the early 2000s. Or the “Gellin'” ads from Dr. Scholl’s. Really. Just go ahead and repeatedly shoot me with a pellet gun from close range. It’d probably be just as painful. On the other hand, there are some fantastic ad campaigns out there that have withstood the test of time. I may have to do a second post about those. But, I will leave you this Sunday evening (a fine one, in that the Cowboys have defeated the Pack) with what I think is one of the strangest commercials I’ve ever seen. UPDATE [9/22/2008]: If you get the Free Credit Report commercials (or some other horrific ad campaign) stuck in your head, you can always head over to The Razor. I guarantee that the Back to Silliness song will get stuck in your head instead. Thank you, Professor. Thank you very much. Tags: International Talk Like A Pirate Day, pirates, Yarr! Avast! The bonny lass over at Road to Waco reminded me that today be International Talk Like A Pirate Day! Moot Court briefs ‘ave addled me brains. Methinks it be high time for some grog! Yarrrr! The weirdest pirate video ever. The weirdest Pirate Flash ever.